1. Place Value: Students scoop candy hearts into a cup. Next, they create groups of tens. The rest of the hearts left over belong in the ones group. Then, they write how many tens and ones they have and figure out the total. 2. Tally / Fractions: Students take the hearts they scooped out and tally how many of each color they have. Then, they write the fraction for each color. 3. Graphing: Students make a graph to represent the colors they have. 4. Estimating: Make a large heart and have students estimate how many candy hearts they think will fit inside of it. Once they make a guess, have them figure out how many will actually fit in it. 5. 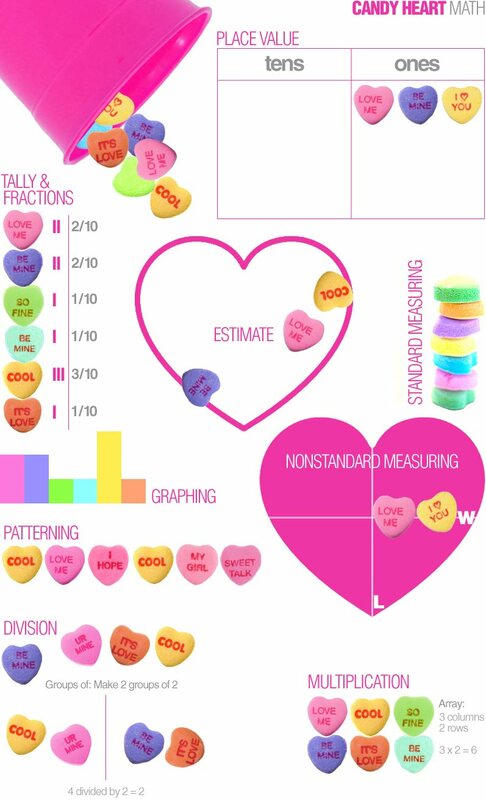 Standard Measuring: Have students make different stacks of candy hearts and record their measurements. 6. Nonstandard Measuring: Make different paper hearts of various sizes. Have kids use hearts to find the length and width. How many candy hearts long and wide is each paper heart? 7. Patterning: Have students create different patterns with their candy hearts. 1. Dissolving: What will a candy heart dissolve fastest in: ice, room temperature, or hot water? Classify candy hearts by number of letters on the heart. Organize them into groups. You can also classify by the message. Is it friendly or mushy? 1. Have kids write original letters or stories with candy hearts! 2. Encourage students to come up with their own unique sayings. What would you say on a candy heart?! Click here to see how candy hearts have changed over time. To integrate Social Studies, look up the history of the candy heart. 3. 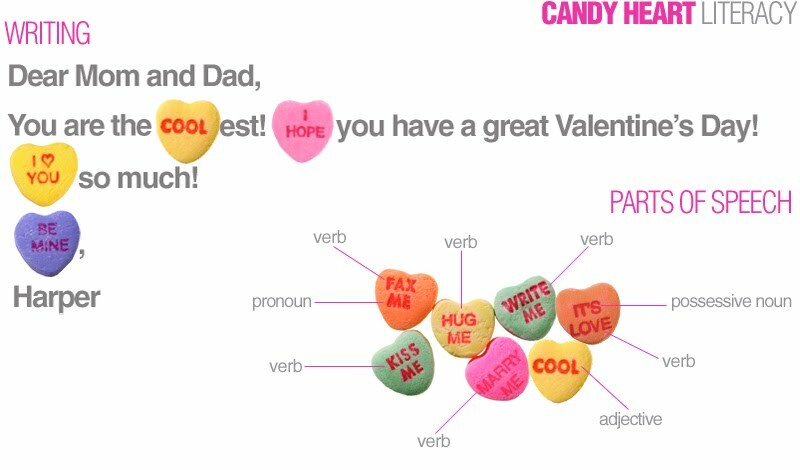 Identify the parts of speech on various candy hearts. This is a great use for those conversation hearts that everyone gets (or gives) and no one eats (except,me, maybe)! I'm definitely going to use some of these ideas. Who says an old dog (43 years in the classroom) can't learn new tricks! Thanks for sharing! Feel free, I'd love to see the post!